From infamous “haunted houses” to the homes, hospitals and hotels where real ghosts are said to lurk, our guide will send you on a witch hunt of terror-bly great fun. And this isn’t your ordinary list of attractions — we’ve rounded up several off-the-beaten-path locations where no one can hear you scream. Not only that, but Mountain Aviation can get you places the big commercial airlines can’t. That’s because private jets can land at much smaller regional and even private airstrips that the big guys don’t service. Here’s our guide to 5 spook-tacular attractions to check out this Halloween, including how to get there in style and safety with a private charter from Mountain Aviation. A lot of people think of Iowa and the Midwest as fly-over country. But there’s a good reason to touch down and book a night at this truly haunted place in a little town called Villisca, Iowa. In June of 1912, Josiah Moore, his wife, their four children, and two overnight guests were all killed by an axe murderer — or several. No one knows how many there may have been, because the crime was never solved. 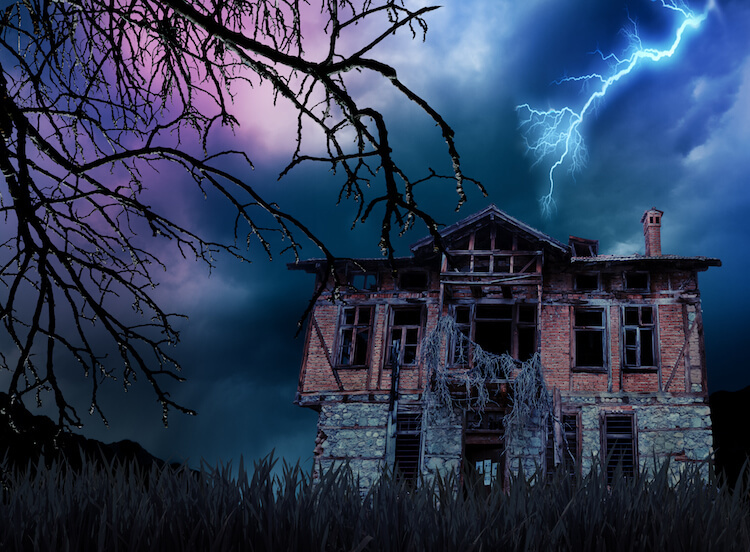 No one has lived in the home since the atrocity, but many visitors, paranormal investigators, psychics, and even skeptics-turned-believers have stories of strange happenings in the house. These days you can book the house (starting at $428/night) to see if the haunted rumors are true. Our pilots would rather stay with the plane, to…um…make sure it stays safe, but hey, you go right on ahead and have fun! Villisca is in a remote area of southwest Iowa, but we can fly you into Schenk Field airstrip, just 15 miles down the highway from the murder house of your nightmares. Courtesy Cab Co. in nearby Red Oak, Iowa will be able to get you to and from the airport. Now you know a place is truly haunted if it inspired a book by the master of horror himself, Stephen King. That’s right, this hotel was the catalyst for King’s famous book The Shining, which went on to make for an even more famously frightening movie. It all started with a spooky evening that King and his wife spent there in the 1970s. They were the only guests in this massive hotel, and it was the night before Halloween. Although Estes is more developed these days, when this hotel was built in 1909, it was a wild, isolated and untamed area. There have been stories of haunted rooms going back through the hotel’s 100+ year history. But things picked up in the paranormal department after The Shining was released. Certain rooms are known to be particularly spirited, which is why the Stanley offers night tours to explore the creepier crannies of the hotel. And this tour is okay for kids too, as long as they’re 10 or older. Tours start at $25/person. Room prices vary, but can typically be booked in the $200-$300 range. The closest airstrip to Estes that we can fly you to is the Boulder Municipal Airport, just under an hour drive from the Stanley Hotel. Travel to the hotel in luxury with a car and driver from Boulder Trip Service. From September 28 through October 31st, Nightfall at Old Tucson entertains and delivers the heebie-jeebies to thrill-seekers from all over. Nightfall at Old Tucson is like a haunted house, except it’s an entire town. And this town’s history as a real Old West movie set, making the attraction feel a little too real for comfort. And if you want to take the family, there are some activities just for kids 12 & under, like the Trick or Treasure walk, which includes meeting a mermaid! Tickets are $29.50 for visitors age 12 & older, $22 for children age 9 to 11, and free for kids 8 and younger. You can fly into either Tucson International Airport or the more exclusive Ryan Airfield, where the larger commercial airlines can’t land. Luxury meets rustic at this desert ranch, which offers a variety of horseback riding adventures for adults and kids. Lounge by the pool and hit the links at this resort’s top-notch golf courses (they’ve got three of them). Sate your palate with a meal at one its high-end restaurants, then walk it off on one of the desert hiking trails that connects to the property. • Get your heart rate going with a round of gambling at this casino and resort. This attraction in Atrox isn’t any old haunted house. This is one of the best in the country, and for one very special reason. At Atrox Factory, the real horrors of your favorite films are there to scare you. Believe it not, the actors who played the likes of Jason and Pinhead from Hellraiser appear to give you the fright of your life. Atrox Factory’s website makes certain what you’re in store for: It states that if you suffer from problems with motion sickness, claustrophobia or intense sounds, you might want to stay home. Tickets start at $20. Leeds is just on the outskirts of Birmingham, Alabama, which means you can fly into the Birmingham-Shuttlesworth International Airport and be getting your scare on in no time. Mountain Aviation can also land you at the smaller St. Clair County Airport in nearby Pell City. The nice thing about being near a big city like Birmingham is you can also enjoy the culture, food, and accommodations the metropolis has to offer. • A distinctive boutique filled with art and other curiosities should add a flair of mystique to your trip. • Located downtown near the Birmingham Museum of Art, the Birmingham Civil Rights Institute, and the Alabama Sports Hall of Fame, this luxury hotel makes as the perfect home base for a fun weekend getaway. Known as one of America’s most haunted homes, this former plantation’s history includes a long list of spooky legends. Built in 1796 (on an Indian burial ground, unbeknownst to the owner), The Myrtles Plantation is rumored to host at least 12 ghosts. That includes a former slave who had her ear cut off by her “master”, but got her revenge by poisoning a cake that killed two of his daughters. Find out the truth for yourself by booking a room at the plantation, as it’s now been converted to a charming (if not slightly eerie) bed & breakfast. Rooms run from $175 to $400 a night. The closest public airfield to this rather remote location in Louisiana is Feliciana Airpark, just a 20 minute drive from St. Francisville and The Myrtles Plantation. For transport to the plantation, you can get a cab from AAA Taxi in nearby Zachary, Louisiana, or check out more luxury options serviced out of Baton Rouge. These places may be scary, but booking a private charter with Mountain Aviation doesn’t have to be!